During my last Disney World vacation with my boys, we enjoyed several tasty table service meals. 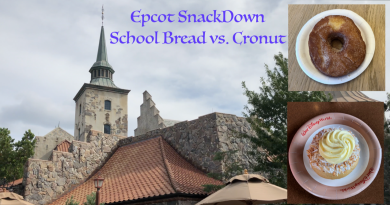 In case you missed it, we dined at Beaches & Cream Soda Shop, ESPN Club and Rainforest Café in Disney’s Animal Kingdom. 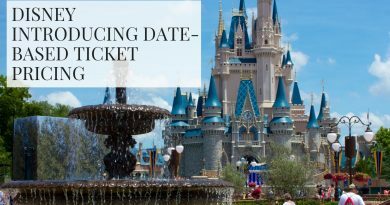 When we headed over for a day in Disney’s Hollywood Studios, we planned an advanced dining reservation (ADR) for one of our favorite spots – 50’s Prime Time Café. 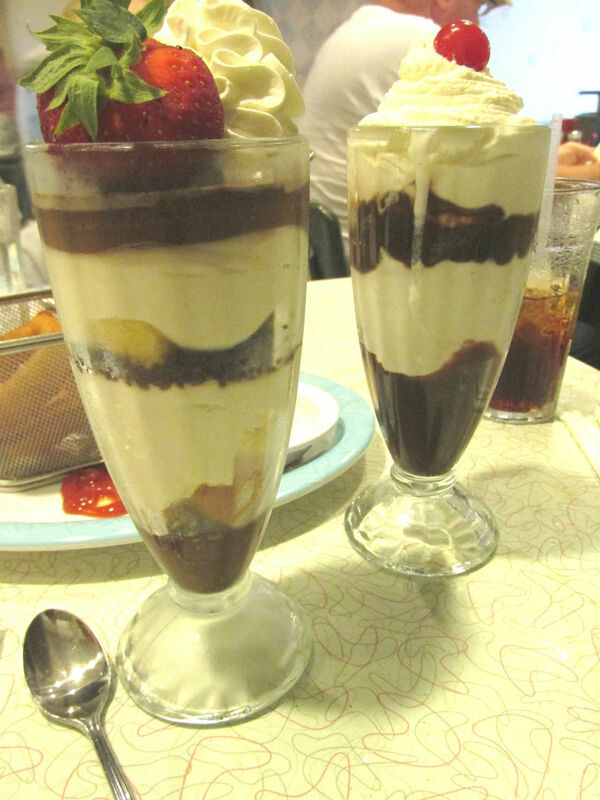 Known for its classic comfort food, vintage atmosphere and lively banter, we were really looking forward to our lunch at 50’s Prime Time Café plus a fun filled day in Disney’s Hollywood Studios. Just like every day of this vacation, we woke up early and grabbed a quick breakfast at Landscape of Flavors at Art of Animation before heading off to the bus stop. Although this resort only has one bus stop and it is often very busy, they seem to have a limitless supply of buses, because we never had to wait for more than about 5 minutes. Once on board, it was standing room only for the short drive to Hollywood Studios. We were soon off the bus, through security and waiting in line to enter the Park. We always like to arrive before rope drop with our touring plan in hand ready to go as soon as the park opens. On the schedule for this day was The Great Movie Ride, a 9am-10am Fastpass+ for The Twilight Zone Tower of Terror, followed by a 10am-11am Fastpass+ for Toy Story Midway Mania before heading to our 11am ADR at 50’s Prime Time Café. After lunch we had a 12:05pm-1:05pm Fastpass+ reserved for Star Tours. We planned to end our day with a stop at the Animation Academy before heading for an evening in Magic Kingdom. This was going to be a lot to fit in just a few hours, but with the smaller size of Hollywood Studios and the fact that we walk quickly, we were optimistic. Once we were through the entrance, we made our way down the street and around the Sorcerer’s Hat (for the last time) to the line for The Great Movie Ride. As luck would have it, the wait was short and we were on the attraction quickly. While not our favorite, we usually ride this attraction every time we visit, because it is one that we can all experience together. My youngest son still covers his eyes through the Alien section and both of my boys are not fans of the live-action gun fight scene. Living in a suburb of Denver, 15 minutes from Columbine High School and 20 minutes from the Aurora theatre, my kids have grown up very nervous about these types of scenarios. It often makes me wonder if this part of the attraction makes anyone else feel uncomfortable. I’m excited to see the changes once The Great Movie Ride is reimagined later this year and I hope that it makes it a more family friendly attraction. After we exited The Great Movie Ride, we made our way to The Twilight Zone Tower of Terror for our 9am-10am Fastpass+. A quick look at the clock and we were checking in for our Fastpass+ at 9:45am with plenty of time to spare. This is another tricky one for my family. My boys are still a little spooked by the premise of the ride and the preshow, but they love the actual attraction and the drops. On this occasion, everyone powered through the scary parts and we all left the Tower of Terror having had an exhilarating time surviving seven drops! Our last stop before lunch was Toy Story Midway Mania for our 10am-11am Fastpass+. Things were continuing to run smoothly with our touring plan and we arrived at 10:20am. For whatever reason, there were very few people in the Fastpass+ line and we were shootin’ our way through the carnival games in no time. I’m proud to say that despite my total ineptitude for video games, I emerged victorious and had the highest score in our car. After depositing our stylish 3D glasses in the bin, we exited the attraction with 20 minutes until our 11am ADR at 50’s Prime Time Café. Our server guided us to our table in a deserted section of the restaurant and left us to look over the menu. 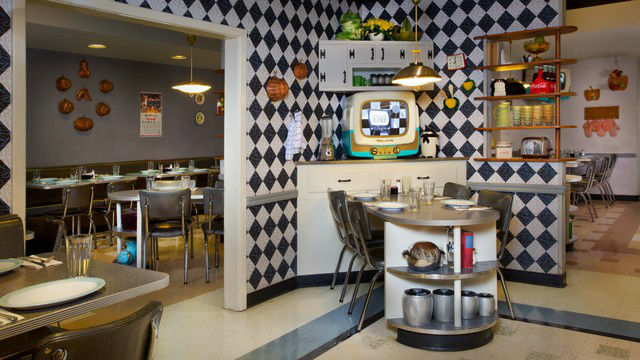 The menu at 50’s Prime Time Café is not large and includes your good old-fashioned comfort foods. It didn’t take us long to make up our minds and we were ready to order when our server returned. 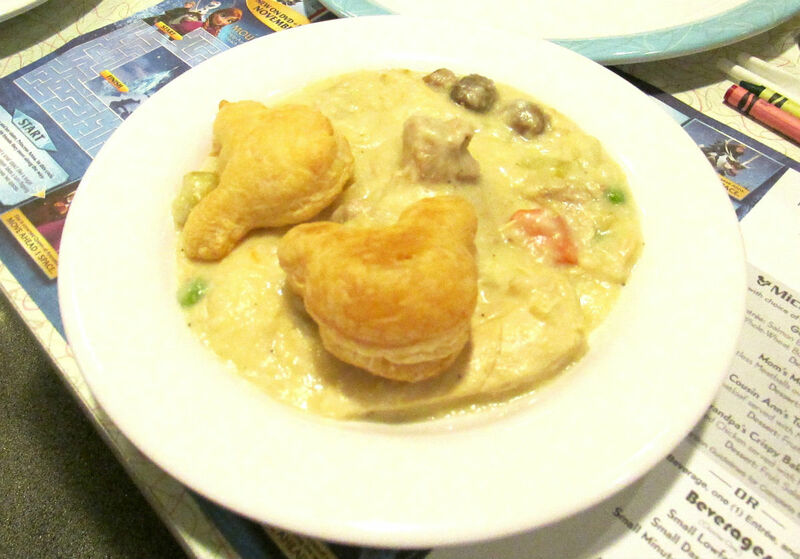 My youngest son chose the chicken pot pie from the kids’ menu, my oldest son and I decided to split some French fries and beer-battered onion rings in the hopes to have room for dessert, grandma went with Aunt Liz’s Golden Fried Chicken, and grandpa selected Grandma’s Chicken Pot Pie. After we had placed our order and received our beverages, we enthusiastically awaited what was to come next. My boys love when the servers really get into the story of the restaurant and play along with the diners. During past meals, grandma was sent to a time out that required her to stand in the corner and my husband had to sing “I’m a Little Tea Pot” in the middle of the restaurant. But my favorite of all was when grandpa didn’t finish his green beans. They were returned to him as his dessert covered with whipped cream and sprinkles, and a bite was even fed to him by our server. It was hilarious and had our entire dining room laughing! Sadly, today was not going to be one of those days. Our server was polite, but all business – no funny anecdotes to share from this dining experience. Our food was soon delivered and we started to dig in. My youngest son was not impressed with his chicken pot pie so he shared the French fries and onion rings we had ordered. Grandpa on the other hand loved his chicken pot pie. I think it was more of problem with my youngest son’s pickiness rather than quality. 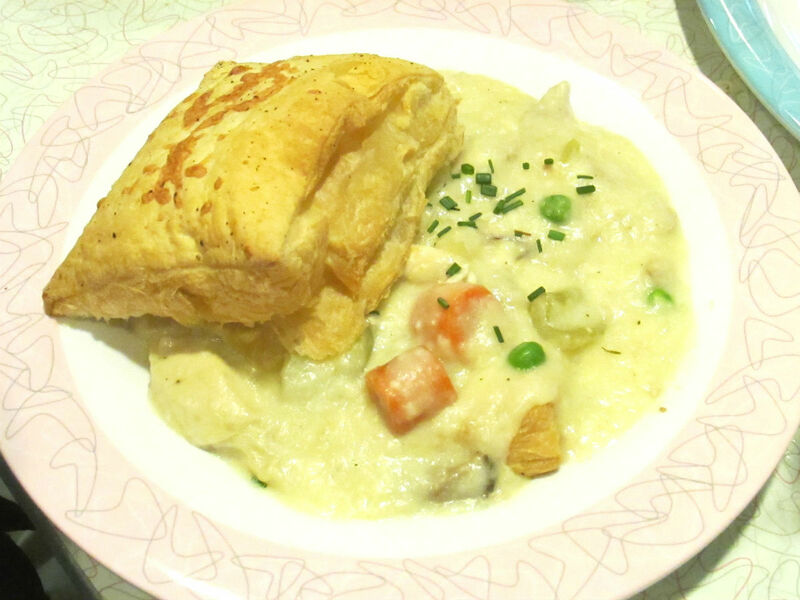 The pot pie was more “gourmet” in nature with puffed pastry instead of crust, thick chicken gravy, and large chunks of chicken and vegetables rather than smaller diced bites. Those of us sharing the fries and onion rings felt that they were average. 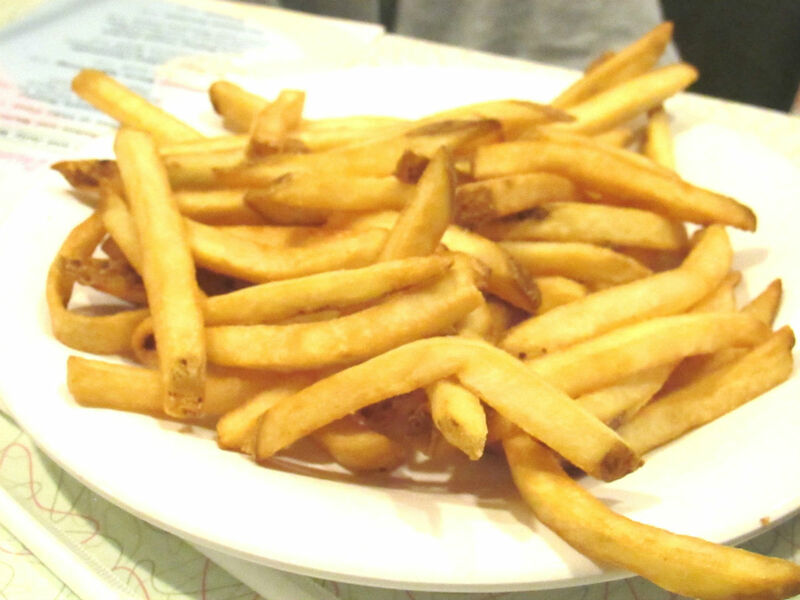 The fries were the exactly the same as what you would get at any Disney World counter service restaurant. 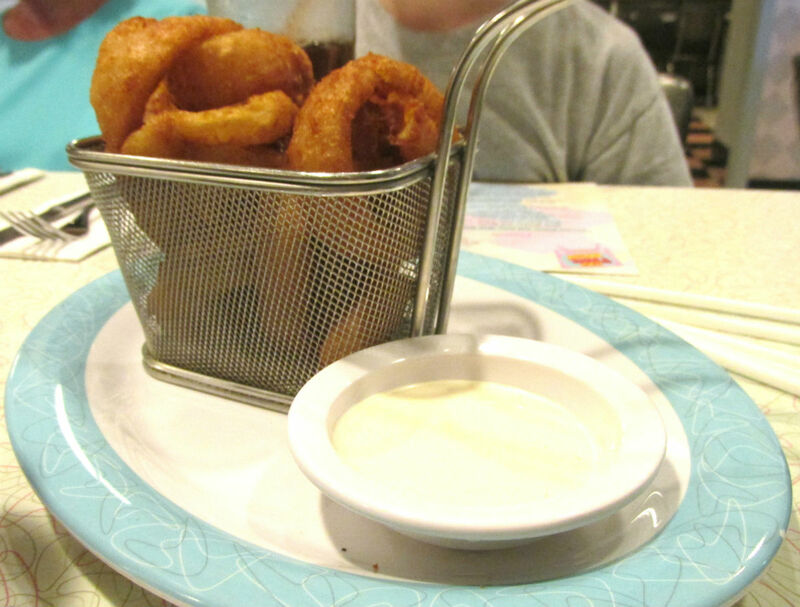 The onion rings had a nicely seasoned batter, but were slightly on the greasy side. Grandma had the best meal at the table, raving that the chicken was perfectly crispy on the outside and still moist on the inside. 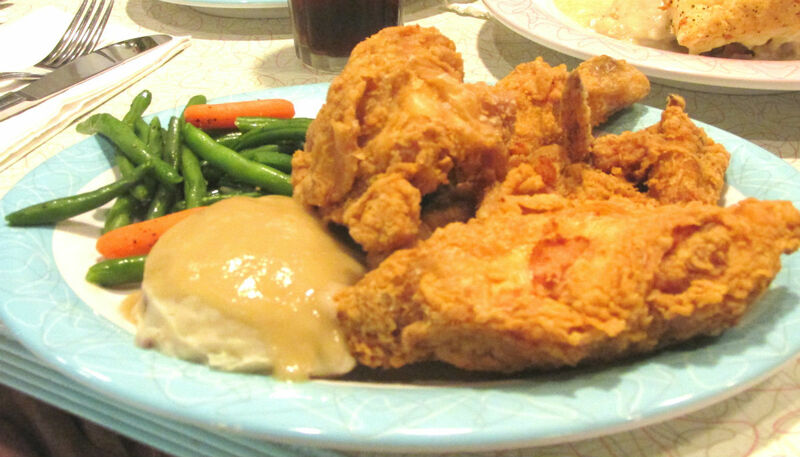 It even reminded her of her mother’s fried chicken – a family favorite. Next up was dessert. My youngest son went with the Ice Cream Sundae from the kids’ menu, my oldest son chose the 50’s Boston Cream Parfait, and I decided on a Hot Fudge Sundae. I’m happy to report that there were no complaints about any of the desserts. 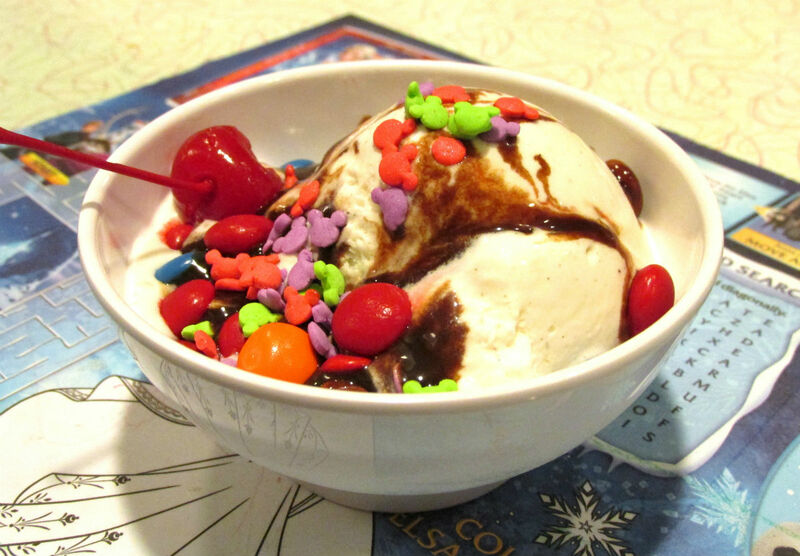 The kids’ ice cream sundae was covered in chocolate and decorated with adorable Mickey Mouse sprinkles. The 50’s Boston Cream Parfait consisted of delicious layers of vanilla ice cream, pound cake, and chocolate fudge topped with whipped cream and a strawberry. And my classic hot fudge sundae was made with vanilla ice cream, mounds of hot fudge and topped with whipped cream and a cherry. They were all scrumptious and our favorite part of the meal. After polishing off our desserts, we checked the time and discovered it was after 12:30pm. We quickly paid our bill and said good-bye to grandma and grandpa as we made our way through the crowded “living room” to the exit. Back outside, we quickly walked across the Park to Star Tours hoping to arrive before our Fastpass+ window closed. Luck was on our side and we arrived just before 1:00pm with five minutes to spare. Although I’m not a Star Wars fan (she says as she ducks to avoid a devastating light saber blow), I do love this attraction. Our last stop before leaving Hollywood Studios was at the Animation Academy to learn to draw a character. On this day, we tried our hand at drawing Flynn Rider from Tangled. About five minutes in, my youngest son decided to abandon his Flynn drawing and instead follow the pictures on the wall to create a portrait of Mickey Mouse. If you haven’t tried this before, I highly recommend it. You don’t have to be an artist and it is a fun way to create a free souvenir. All-in-all, we had a wonderful time at Hollywood Studios. 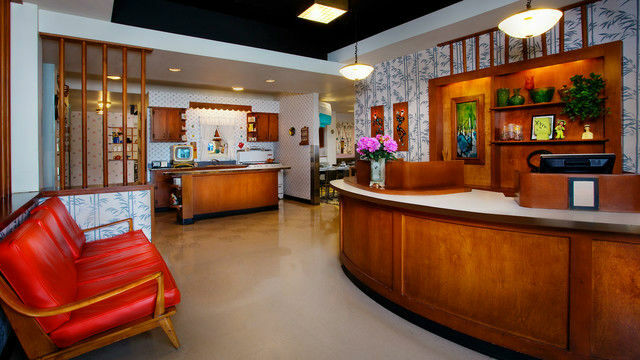 If you are planning a visit to the 50’s Prime Time Café at Disney’s Hollywood Studios, here are the important details that you’ll need to know. 50’s Prime Time Cafe does require park admission. It is located inside Disney’s Hollywood Studios near Echo Lake. You can make advanced dining reservations by clicking here. 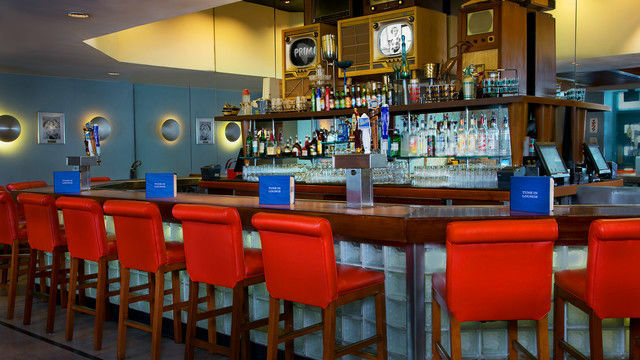 If you are unable to secure a reservation or choose not to, you can dine at the Tune-In Lounge which is the bar located in the “living room” waiting area of 50’s Prime Time Café. 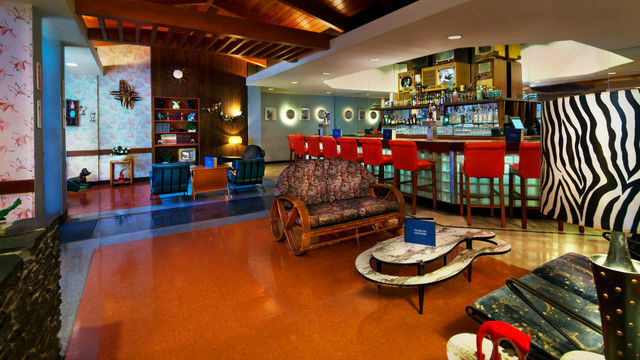 They serve the complete restaurant menu as well as offering a full bar. 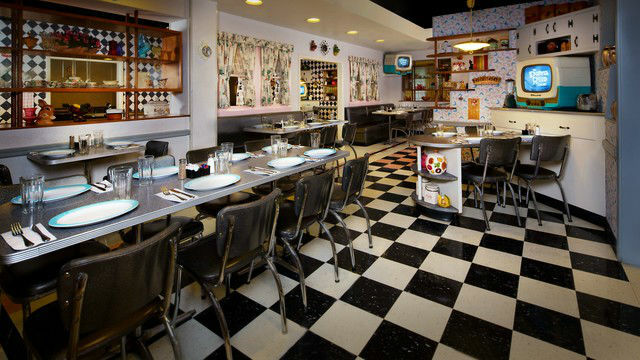 Have you dined at 50’s Prime Time Cafe? What was your experience? We love 50s Prime Time! During our trip in August we had a group of 8 for a late lunch. Our waiter was awesome! He really played his part and made it enjoyable. When we asked him to take a group pic of our table, he grabbed our phone and took a group selfie! So sad you didn’t get the full experience on your trip, thanks for the write-up! The 50’s cafe really appeals to my 13 year old daughter. She loved learning about the “olden days ” and we had a fun waiter. He asked my daughter a few questions and after discovering she loved theater, asked her to write down as many names of Disney movies that were once Broadway shows. This kept her busy throughout dinner so my husband and I almost felt like we were on a date. Certain foods on the menu are certainly better than others. The sample platter gives you the best chance to try their most popular dishes. The fried chicken is delicious and has enough to feed two people. If you are not on a meal plan, consider splitting an appetizer, a main meal and a dessert. You will get more food than you need. Hi Michelle – Great tip about splitting meals, because the portions are definitely huge! My parents love the sampler platter and often split it so they can enjoy some of all the classic comfort foods. It also makes dining at 50’s Prime Time Café much more economical. One of the best places in Hollywood Studios and for Seniors a nice place to enjoy some old fashion meals (Meatloaf, Pot Roast, Fried Chicken, etc.) and some old TV clips. Just be sure to eat your vegetables and mind your manners or else!! Nice review and have a good time on your next visit. Hi Don – Great point, that seniors might enjoy the old-fashioned meals and TV shows. I’m glad that you liked my review! I’ll also chime in that the fried chicken and chicken pot pie are easily large enough to split between two people. (And we’re big eaters!) Overall, we always have fun here! As long as you have a sense of humor you should give it a try. Hi Daisy – I agree that we always have fun at this place, even if our server isn’t really playing along. It’s just as entertaining watching the “show” that happens at the tables near you, too. 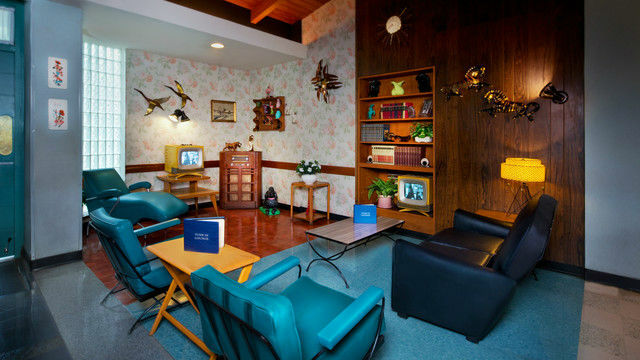 Hi Cassie – Sorry to hear that you had such a disappointing experience at 50’s Prime Time Café. We’ve had that same problem hearing our name being called especially during the peak meal times. We’ve been lucky enough though never to have been treated rudely.